Tom Bradley at Steadyhand is carefully planning to unleash his inner investing greed. With the current pessimism in the markets it may be a great time to make a bet on stocks, but I’ll stick to my regular rebalancing plans. Million Dollar Journey gives an overview of the most important recent changes to mortgage rules. For a more detailed analysis, check out Canadian Mortgage Trends. The Blunt Bean Counter reports on the announced IRS tax amnesty for U.S. citizens living in Canada, but he makes it clear that there are still many unanswered questions. Larry Swedroe has some fun with an article saying that index investing is for those not smart enough to pick stocks. Big Cajun Man has an instructive tale of exercise bikes. One useful takeaway is that the enthusiasm for starting an exercise regimen should be channeled into exercising rather than buying expensive clothing or equipment. Another is that so few pieces of exercise equipment in people’s homes get regular use that the used market for equipment heavily favours buyers. My Own Advisor updates his progress on his personal finance goals. His quantitative approach is a good model for others. Some people feel good about hitting several small goals while running up their lines of credit, but Mark doesn’t make this mistake. Retire Happy Blog gives you some important things to think about if you’re planning to retire in a different country. Back then my only real criticism was that human capital should take into account the cost of your basic needs for food, clothing, and shelter. With this caveat, I believed that taking human capital into account when making financial decision was sensible. I’m much less positive about this idea now. I think that for most people, there is great uncertainty in the total of future income. It’s easy to look back at your life and decide that your career was inevitable, but I doubt you thought this when you were young. Comparing my career to my father’s is instructive. We had similar technical abilities, but his income was cut short by an adverse health event in his late 30s. If he had already spent some of his expected future high income, the result would have been a disaster. Fortunately for me, I’ve had no serious health problems. Looking at me back when I was 25, it turns out that my human capital was large, but my father’s human capital viewed from his 25th birthday turned out to be modest. These facts were not predictable when we were young. My thinking now is that human capital is sufficiently uncertain that people should be very careful about borrowing against it. Borrowing for an education that gives good employment prospects is sensible, but borrowing against future income to upgrade your lifestyle is a dangerous game. The nature of competition in active investing is different from competition in other endeavours. The impact of MERs on mutual fund returns. MER drag on returns in pictures. Many bank fees should be considered interest charges. Hot water heater: rent vs. buy. Dihydrogen monoxide de-contamination to be costly for municipalities. New changes to mortgage insurance rules are on the way in an attempt to prevent people from getting in over their heads. Rob Carrick says that the age of free banking for seniors may be ending. It’s possible for people of any age to pay minimal fees by cleverly combining online banking with traditional banks. Canadian Capitalist says that one-month market declines of 20% or more are not as common as Horizons ETFs makes them seem in their marketing materials for Black Swan ETFs. Canadian Couch Potato says that for passive investors, there is no such thing as over-diversification within an asset class. Big Cajun Man tries to get a handle on the crazy pricing of anti-virus software. My Own Advisor finds that with the ever-expanding list of available ETFs, the ETF world is looking more and more like the mutual fund world. The Blunt Bean Counter explains the pros and cons of holding shares of a new corporation directly, through a family trust, or a holding company. Retire Happy Blog describes some of the common investing behaviours that hamper our returns. In case you’re having trouble deciding whether to support the Conservatives, Liberals, or the NDP, here is a very short financial quiz to help you. Just pick the answer that feels right to you. If readers have ideas for other questions whose answers mock all three political parties, I’d be happy to read them in the comments section. For a math guy like me, Moshe Milevsky’s The 7 Most Important Equations for Your Retirement was a must-read. Milevsky devotes a chapter to each of the equations most important to retirement planning and does his best to explain the equation to non-specialists as well as tell the interesting history of the people behind the development of these equations. This book is ideal for readers interested in what lies behind retirement planning software. The equations Milevsky includes answer questions like, how long will my money last, how long will I live in retirement, what is a pension annuity worth, and is my current plan sustainable? There are no precise answers to these questions, but the equations take into account this uncertainty. For very mathematical readers, the book tends to gloss over fine details. For example, the first equation that computes how long a pot of money will last with a fixed interest rate and fixed withdrawals is a continuous approximation whose interest rate parameter is actually an instantaneous interest rate. However, these finer points will have little effect on any practical retirement plan. An interesting fact I learned was that “people who voluntarily purchase life annuities actually live longer than the rest of the population.” The gap is about 5 years. It’s not clear whether people actually have some sense of their longevity or whether have an annuity somehow makes you live longer. I’d imagine that some annuity salespeople would make this part of their sales pitch. One equation that I didn’t find very useful is one that calculates your asset allocation percentages for stocks and fixed-income investments. One of the inputs into this equation is your human capital, which is the present value of future earnings. This figure has a high degree of uncertainty and cannot be distilled into a single number, particularly for young people. In addition to the uncertain human capital, the asset allocation equation makes the problematic assumption that you can borrow at the risk-free rate. You can’t, particularly for large loans. Another built-in assumption is that stock prices follow a normal curve. They don’t, and this severely limits the amount of leverage that makes sense. I’m also leery of the “isoelastic marginal utility assumption,” which is mathematically convenient, but hard to justify. A result of these problems is that the asset allocation equation gives some wild answers. For example, even an extremely risk-averse young person in one example shown in the book is recommended to be leveraged 4:1 in stocks. This means taking $50,000 in savings and borrowing another $150,000 to invest $200,000 in stocks. A less risk-averse young person in the same situation has optimal leverage of 31.5:1! Despite these criticisms of one of the equations, I quite enjoyed the book and recommend it to anyone with some mathematical curiosity and interest in planning for retirement. Freakonomics summarizes some experimental results showing that people are willing to pay for future predictions even when it is obvious that the predictions are useless. Canadian Financial DIY tears a strip off Labour-Sponsored Investment Funds. Million Dollar Journey did an interesting comparison of the costs of top universities in the U.S. and Canada. Canadian Capitalist looks at two new ETFs, HUT and HUS.U, and asks whether black swan protection is worth the cost. Big Cajun Man sits at his daughter’s graduation ceremony and reflects on how much money her degree cost him. Retire Happy Blog explains what you’re giving up if you have no will. My Own Advisor is planning for low interest rates for more than another year. I’m sure that I don’t know where interest rates are going, but Mark’s plan to avoid adding new debt sounds pretty safe even if rates rise. Rob Carrick commiserates with one of his readers who is unhappy about the difficulty of making a positive real (above inflation) return safely. Some of the spots at a $1 million buy-in poker tournament called the Big One were won by players playing and winning satellite events. These players are then faced with a difficult choice: play the Big One for a shot at many millions, or sell the spot for as much as they can get. The dollar amounts are definitely life-changing, and it can be difficult to make a rational choice. How much is a spot in this tournament worth? 1. Not all players have equal skill. 2. Looking at the arithmetic average payout ignores risk. Let’s begin with the simplifying assumption that the player considering selling his or her spot is equally likely to end up in any position from first to 45th. This takes skill out of the equation. It turns out that a person’s net worth is an important factor in valuing risk. It makes sense that a billionaire would be less concerned about losing a million dollars than an average person would. Using these assumptions, a person with a net worth of $100,000 would value a spot in this poker tournament at only $94,799. This is a substantial discount to the average payout, but it reflects the fact that taking this amount almost doubles net worth. If we add human capital (future earnings) to net worth, then most of us would assume a net worth of at least $1 million. But at this net worth, the spot in the tournament is still only worth $316,465. At a net worth of $10 million, the spot’s value goes up to $657,143, and at $100 million, the value goes up to $850,044. All this shows that poker tournaments have high risk because so much of the prize money is loaded into the top few spots. If they are being rational, most people should be willing to part with their spot in this tournament for less than $400,000. For couples with the happy problem of having used up all their RRSP and TFSA room, excess savings in taxable accounts generate income that gets taxed. Usually, it’s better if the lower-earning spouse with a lower marginal tax rate declares this investment income, but attribution rules get in the way. Here we look at a way to build assets in the name of the lower-earning spouse. Let’s use an example to avoid using the awkward term “lower-earning spouse” any further. Jim has a soul-destroying corporate position paying $200,000 per year. His wife Sandy makes $35,000 per year selling flowers in a small shop. They have used all their RRSP and TFSA room. They have additional savings that build up in a taxable account. If Jim and Sandy do nothing special, the taxable account would likely be full of money from Jim’s income and Jim has to declare the returns generated by this account on his taxes (even if the account is in Sandy’s name). If Sandy could declare this income, the couple would pay less tax overall. The solution is to have all of Sandy’s income go into a taxable account in her name, and for the couple to use Jim’s income to pay family expenses. This way the taxable account would be full of Sandy’s income and the investment returns would be taxable in her hands. This is an approach that my wife and I use. An interesting question is how far can Jim and Sandy push this? In a safe version of this idea, Sandy saves only her take-home pay and she pays any income taxes she owes at the end of the year herself. Here are some questions about whether this can be taken further in order to increase the amount of savings in Sandy’s name. 1. Can Jim pay any additional income taxes Sandy owes at the end of the year? 2. Can Jim reimburse Sandy for the taxes deducted from her paycheques? The idea here is that Jim pays all of Sandy’s taxes. 3. If Sandy owns the flower-selling business, can Jim pay the businesses expenses so that Sandy is free to save her total revenues rather than just her net income of $35,000? One opinion I’ve received on these questions is that #1 might be okay, but could be a problem, #2 is definitely pushing it, and #3 is just inviting tax problems. I haven’t tried any of these ideas and I have no interest in breaking tax rules, but I would like to know for certain whether any of these 3 is deemed acceptable by CRA. Robert Laura is convinced that “buy and hold” doesn’t work, which is news to me. I do a lot of reading and make a point of seeking out different points of view, so I read Laura’s Forbes article. After all, how can you learn something new if you only listen to people who agree with you? As proof that buy and hold doesn’t work, Mr. Laura observes that “going back to 1990 when the Dow traded around 2,750, you'll find is that the Dow reverts back to within 1% of it's [sic] opening value at least once.” That’s a shocking piece of news: stock markets go up and down. The last time I checked, stock markets had volatility before 1990 as well. “No one can pick a perfect top or bottom but that doesn't mean you shouldn't take gains and cut losses on a regular basis.” That sounds smart, but what does it really mean? How do you know when is the right time to take gains or cut losses? All evidence says that when the typical investor tries to time the market, he or she makes less money than a buy-and-hold investor. The rest of the article is an impassioned plea for people to become active investors because “Our financial world is rapidly changing and our global economy is becoming more and more difficult to navigate.” In reality, I think outperforming buy and hold with active investing has been getting progressively more difficult over the decades. Modern times call for more investors to abandon active investing and adopt buy and hold. It’s easy to look back at past stock prices and imagine how much more money you would have if you bought and sold at the right times. You might even convince yourself that some of the market’s movements were predictable, but the truth is that most investors did not predict them. Canadian Mortgage Trends gave an update on the latest OSFI guidelines for HELOCs. It looks like they’re backing down from the idea of making borrowers re-qualify when they renew with the same lender. Preet Banerjee says that whether you’re a DIY investor or have an advisor, you need to educate yourself about investing, either to do it yourself or to choose a good advisor. The Blunt Bean Counter explains the business and income tax issues in selling a corporation. Big Cajun Man’s list of sure-fire father’s day gifts seems suspiciously like they are aimed at his own children. Million Dollar Journey is giving away copies of Rob Carrick’s latest book How Not to Move Back in with Your Parents, but hurry because the draw closes at 5 PM EST today. A reader, A.N., is in the throes of working out his family’s financial plan and is seeking comments. Here is a lightly edited version of A.N.’s thoughts along with my comments. I need to have a liquid reserve to support my family for 6 months; money market, savings account, short term real return bonds; with time I’ll keep increasing the amount through regular contributions of 10% of income. It’s smart to have an emergency fund. The exact amount for the fund depends on how likely you are to lose your job and how long it would take to get a new job. I would say that 6 months of living expenses is toward the high end but may be quite sensible for your situation. A money market fund or a savings account makes sense. I’m not sure that real-return bonds have enough choices of maturities to allow you to limit yourself to just short-term bonds. Keep in mind that this fund is intended to deal with unexpected events and should not be invested in anything volatile. RRSPs make sense, but may not be enough. You’re right that even if you make maximum RRSP contributions, your ultimate savings may not be enough to derive the income you want in retirement. If you are able to save more than this, then you should consider a TFSA as well. I’m considering an asset allocation of 40% bonds, 60% equity (equally divided among Canadian, US and global). This is a fairly typical allocation for someone who is still at least a couple of decades from retirement. I’ve chosen an all-stock allocation for myself, but this isn’t for everyone. The important thing is whether you are able to keep your head during the next stock market downturn and keep rebalancing as necessary. Note that when stocks drop, rebalancing means buying more of the stock asset class that has dropped the most. You need to choose asset allocation percentages you can stick with when the media is screaming that stocks are dropping to zero. I’m considering the following equity investments: no load index funds, blue chip for now; when market recovers, add small cap; use currency neutral for global, possibly limit “global” to “BRIC”, though R does not fire up my imagination. If you wish to use index mutual funds, TD’s e-Series are a good choice, although TD employees will do their best to steer you to their expensive funds. An alternative is broad index exchange-traded funds (ETFs) from iShares or Vanguard. I’m assuming that “blue chip” means a large-cap index. I prefer to own ETFs that cover a full range of company sizes, but this is more difficult in Canada than it is in the U.S. I don’t have the ability to predict when it would be best to jump into small-cap stocks; are you sure that you do? I have no opinion on which parts of the world will give the best returns. By going after the hot parts of the world you risk always buying high and selling low. I’m considering funds of long-term / low-risk bonds for the time being; when stock market recovers - ? I find most bond mutual funds to be very expensive. TD e-Series has a low cost bond fund. In the ETF space, iShares has some low-cost bond funds. From your comment, it sounds like you may want to change the type of bonds you own or your percentage allocation to bonds when stock markets start rising. I don’t try to do this sort of thing myself. There are many investment firms that employ brilliant people who try to outsmart each other in this way. I see no upside in playing this game; I just stick to my asset allocation through thick and thin. I plan to avoid gold – as an investment class it is too specialized. I avoid gold mainly because it has little inherent value relative to its price. Its industrial and jewelry uses don’t come close to justifying its current price. People buy it in the hope of selling it to someone else for more money. I’m not interested in a high-stakes game of hot potato. I think the above should allow me to sleep well and still generate reasonable returns through thick and thin – I need 5% to retire. Whatever is left after annual costs and above investments can be invested in something riskier or spent on leisure and hobbies. I’m not sure what you mean by needing 5% to retire. Does this mean you need 5% investment returns to build up enough savings to retire, or maybe that you will need 5% returns after retiring to derive enough income? In any case, most advice these days is that you should count on withdrawing less than 4% of your pre-retirement savings each year to have a reasonable chance of having your savings last for the rest of your life. If A.N. manages to build 6 months of emergency savings, maximize his RRSP contributions, avoid expensive forms of investing, and avoid panic selling or chasing hot investments, he will likely have a wealthier retirement than most Canadians. The dividend tax credit (DTC) has been doing a progressively worse job of compensating for the dividend gross-up in recent years. This has given rise to “phantom income” for dividend investors. The first time I filed my taxes in a year where I received a dividend in a taxable account, I was surprised to find that I had to declare more income than I actually received. 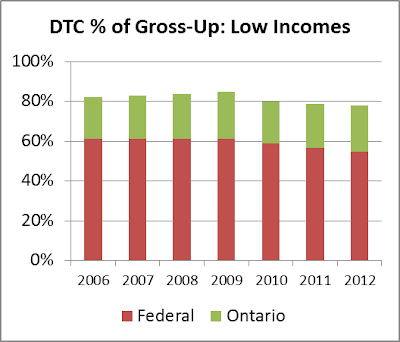 This is called the dividend “gross-up”. Fortunately, I also got a deduction from the taxes I owed, called the dividend tax credit (DTC). The idea behind this tax treatment is to coordinate the taxes you pay and the taxes the company distributing the dividends pays. Initially, the company earns some profits, but must pay taxes on these profits. Then the company can pay dividends out of the lower after-tax profit amount. Tax laws for individuals are designed to give you credit for the taxes the company paid. The idea is that you declare the larger amount (which is more than you actually received in dividends) as income, and then get a tax reduction equal to the taxes the company paid. In theory, the total tax paid by you and the company is the same as if you had earned the larger amount as regular income. However, in practice, this hasn’t been working very well since 2006. From the point of view of the investor, we start with the actual amount of dividends and then gross this up by some percentage to get the larger amount which is the company’s income before taxes. For exact coordination between company taxes and individual taxes, the tax reduction you receive should exactly match the amount of the gross-up. For several years ending in 2005, the dividend tax rules had been steady. An investor who collected a $120 dividend would have to gross-up this amount by 25% to $150 and declare this larger amount as income. Then the investor would get a $20 reduction in federal tax and (in Ontario) another reduction in provincial taxes of between $7.70 and $12 depending on whether the investor’s income was high enough to pay the Ontario surtaxes. So the gross-up is $30, and the tax reduction is between $27.70 and $32. This is reasonably close to coordination of total taxes paid by the investor and the company. However, starting in 2006, governments have been tinkering with the amount of the gross-up and the amount of the tax reduction (DTC). 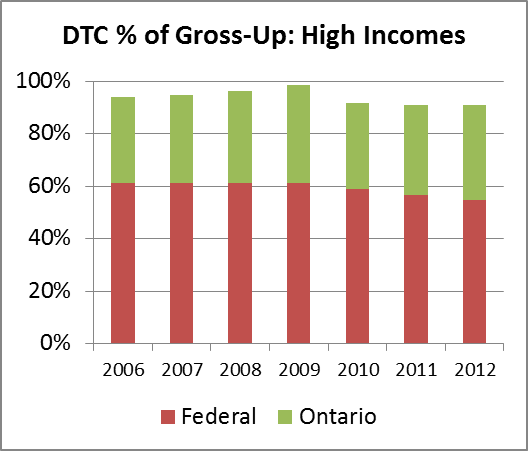 The following chart shows the total of the federal and Ontario DTC as a percentage of the dividend gross-up for people with high enough incomes that they pay the Ontario surtaxes. For 2012, the DTC for low incomes is too low by 22%. So, if we assume that a fair tax is one that exactly coordinates personal taxes and company taxes, we are paying too much by between 9% and 22% of the gross-up. Expressed as a percentage of actual dividends received, in 2012 we will pay between 3.5% and 8.4% too much in taxes on dividends depending on income level. When people like Gordon Pape talk of phantom income from dividends, they are referring to the entire gross-up amount. While I don’t think it is reasonable to expect to get the tax credit without adding a gross-up, it is fair to say that a percentage of the gross-up is phantom income and that this percentage has been increasing in recent years. Many thanks to Canadian Investor who writes Canadian Financial DIY and How To Invest Online for pointing out the DTC gap in a comment on my earlier post about the tax system and retirees. 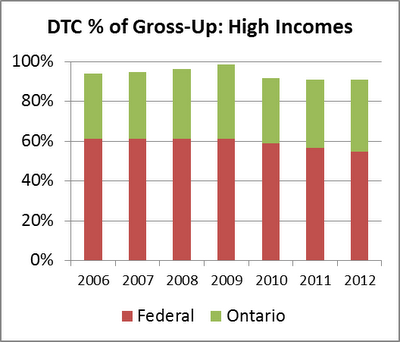 I still don’t agree that the dividend gross-up is phantom income, but a percentage of it is phantom income and this percentage has been rising. A recent request to advertise on this blog came from a company I won’t name, but their web site’s home page contains a prominent risk warning about their leveraged spread products. Part of the warning says “losses can quickly exceed your initial deposit” and “not suitable for all customers.” This should scare people away, but I wonder if it draws some people in. Repeated warnings of adult content in television shows seem to be more a form of bragging than warning. I’m sure there are parents who use these warnings to find tame content for their children, but more often these warnings draw viewers in. On a certain level the risk warning on the web site was saying that the investment products are only for sophisticated investors who know what they are doing. That can be like telling a teenager not to try smoking if he’s chicken. I’m willing to be that most of this company’s clients are men. The title of Rob Carrick’s latest book, How Not to Move Back in with Your Parents, makes it very clear that he is aiming at young adult readers. He delivers sound and understandable financial advice about school, debt, banks, investing, cars, homes, weddings, and insurance without being preachy. I suspect that many people a little older than his target market would benefit from reading this book as well. One of the main strengths of this book is Carrick’s ability to give practical advice to people in a range of different circumstances. He acknowledges that contributing to RRSPs, TFSAs, and RESPs is a difficult to achieve ideal and explains how to choose just one if you must. And failing that, at least don’t run up your credit cards. The book contains a number of profiles of young people who have made a few mistakes, but mostly they model positive financial behaviour. These profiles create a feeling that the young reader is getting advice from a peer rather than from an old man (sorry, Rob). An interesting tidbit I learned about low-fee student bank accounts is that students must periodically prove that they are still going to school. Otherwise they risk being charged regular fees like other adults. The book contains a number of “hotlists” including a very useful list of banking blunders topped by “racking up excessive ATM fees.” It’s amazing how many people are willing to pay $3 to take $20 or $40 out of an ATM. Another good list is the “costs of home ownership that will surprise first-time home-buyers.” In the hotlist of “reasons not to buy mortgage life insurance from your bank” I think Carrick missed the top reason which is that the insurer doesn’t check whether to grant you coverage until after you die. There are cases of people paying for this insurance, dying, and then the insurance company refusing to pay off the mortgage. Carrick quoted a poll “indicating that the number of young adults aged 18 to 34 with RRSPs had fallen close to the lowest level in a decade, at 39 per cent.” I wonder if this is largely because some young people have chosen to save in TFSAs instead. One interesting piece of advice for young people planning their financial futures was to gently check on the state of their parents’ retirement savings to find out if their parents are likely to need financial help in the future. Carrick advises broaching the subject under the guise of asking for advice. That would certainly work on me if one of my sons tried it. A quote from Jamie Golombek: “80 per cent of all RRSP withdrawals are done by people under the age of 60.” Since most retired people convert their RRSPs to RRIFs before making withdrawals, is this a surprising statistic? In conclusion, I highly recommend this book to young adults looking for solid information and sound financial advice. Their parents might do well to read it, too. Retire Happy Blog takes a look at the difficulty of replacing consumer items under an extended warranty. I found it interesting to read that only a little over 10% of warranty premiums gets paid out in claims. Preet Banerjee says that marketers are going after your sense of smell. Big Cajun Man wrote a parent’s lament about youth unemployment. My Own Advisor gives “square-foot gardening” a try.